A beautifully restored "Party" sofa designed by Edward Wormley for Dunbar. Reupholstered in Fret's Mojave bouclé. 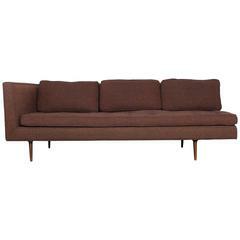 A Classic modernist Chesterfield &quot;Part Sofa&quot; designed by Edward Wormley for Dunbar. Pair available. An armless banquette sofa with walnut legs. Designed by Edward Wormley for Dunbar. A large and rare sofa model 5305 designed by Edward Wormley for Dunbar. Angled form over bleached mahogany legs with leather capped feet. A one armed sofa or chaise with brass legs. Designed by Edward Wormley for Dunbar. This "Party" sofa by Edward Wormley for Dunbar is a take on the Classic Chesterfield sofa with rolled arms and biscuit tufting. This sofa is upholstered in a green mohair velvet. Sofa floats on espresso tone mahogany legs. Designed by Edward Wormley circa 1950s. 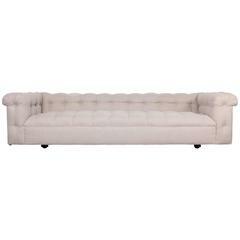 Classic Dunbar sofa by Edward Wormley. Fully restored and reupholstered in light grey mohair. Edward Wormley Dunbar sofa can be paired as a sectional with matching chaise longue 5525 we have offered in another listing.